^ Svrluga, Barry (2018-02-21). "Bronze doesn't begin to tell the story of the greatest female ski racer of all time". Washington Post. ISSN 0190-8286. Archived from the original on 2018-02-21. Retrieved 2018-02-21. ^ Holland, Rebecca (2018-02-08). "Don Kildow, Lindsey Vonn's Grandfather: 5 Fast Facts You Need to Know". Heavy.com. Retrieved 2018-02-12. ^ "Ski and Snowboard Club Vail". Skiclubvail.org. Retrieved 2018-02-20. ^ "Tom Krebs". Vail Daily.com. Retrieved 2013-04-20. ^ a b "Ski and Snowboard Club Vail". Skiclubvail.org. Retrieved 2017-03-01. ^ "Ski and Snowboard Club Vail". Skiclubvail.org. Retrieved 2017-03-01. ^ "Emotional Vonn gets WC win No. 77 after injuries". ESPN.com. Retrieved 2017-01-23. ^ "Lindsey Vonn debuts at Pyeongchang Olympics, fails to medal in women's super-G". Espn.com. 2013-07-16. Retrieved 2018-02-20. ^ "Women's Downhill Live Results". nytimes.com. 2018-02-20. Retrieved 2018-02-20. ^ Seth Rubinroitt. "The secret messages Lindsey Vonn wrote on her Olympic race suit". nbcolympics.com. Retrieved 2018-02-23. ^ Up Next. "Lindsey Vonn Wins Bronze, Cries". Msn.com. Retrieved 2018-02-22. ^ Cindy Boren. "Lindsey Vonn breaks down in tears after final Olympic downhill race". washingtonpost.com. Retrieved 2018-02-23. ^ Hyung-Jin Kim. "Lindsey Vonn Scatters the Ashes of Her Grandfather, a Korean War Vet, Near the Olympic Downhill Course". time.com. Retrieved 2018-02-23. 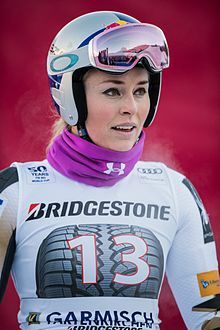 ^ "Lindsey Vonn: US skier to retire at the end of the 2018-19 season". bbc.co.uk. 11 October 2018. Retrieved 17 November 2018. ^ Hodgetts, Rob (21 November 2018). "Lindsey Vonn injures knee, delays season start". cnn.com. Retrieved 24 November 2018. ^ Graham, Pat (1 December 2018). "Lindsey Vonn postpones retirement to return to Lake Louise next season". CBC.ca. Retrieved 27 December 2018. ^ "Ramona Siebenhofer wins back-to-back downhills, Lindsey Vonn finishes ninth". BT Sport ESPN. 19 January 2019. Retrieved 31 January 2019. ^ "Lindsey Vonn considers immediate retirement as injuries take their toll". cnn.com. 20 January 2019. Retrieved 2 February 2019. ^ Schad, Tom. "U.S. skier and Olympic gold medalist Lindsey Vonn announces retirement". USA Today. Retrieved 1 February 2019. ^ hermesauto (2019-02-10). "Skiing: Lindsey Vonn takes bronze in swansong as Ilka Stuhec retains world downhill crown". The Straits Times. Retrieved 2019-02-10. ^ CNN, Aimee Lewis. "Lindsey Vonn: Donwhill bronze for the American in final race". CNN. Retrieved 2019-02-11.